The Swiss had some kind of nationwide obsession with the Mac, it seemed, even though Apple Switzerland (as in the office) wasn’t reality until 1995. It wasn’t like that made any difference, though: before the Wallisellen office was set up, the nation was already engulfed in Mac mania. I was invited in 1995 to an office which was completely run by Macs (see, the Swiss were thinking different even before iSteve returned! ), and there I got my first click on the Internet — unsurprisingly, the first site I visited was apple.com. I’m still missing a few pictures from one of my Macs or hard drives out there that showed in essence a Mac museum on Riedtlistrasse in Zürich. Never mind I only took a few pictures on a rather crappy Sony Ericsson cameraphone (back in the day, the camera had to plugged in, and the resolution was awful); it was there, which mattered the most. 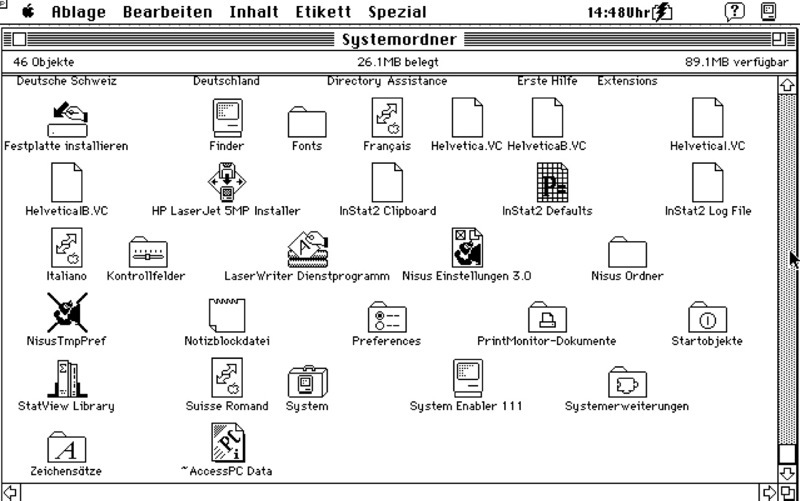 The screenshot shows a Mac running a German version of Mac System 7.0.1 based on Swiss usage of German and is intended as a picture for referential use only.